Moderate seven mile round trip with an elevation gain/loss of about 1000 ft. 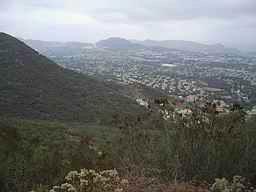 This hike follows Oak Creek Canyon Trail south and Los Robles Trail west to Angel Vista. Angel Vista is a perfect spot to stop for a snack at the picnic table, and to enjoy views of the Conejo Valley, the Oxnard Plains, and (on a clear day) Channel Islands. 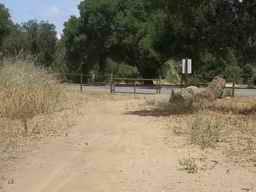 How to get there: From the 101 freeway, go to the south end of Moorpark Rd., turn right on Greenmeadow Ave. and proceed about 1/2 mile to the lot at the end of Greenmeadow Ave. The trailhead is well marked by a large sign. Nearby, you will find convenient parking, a restroom, an informational kiosk, and trail maps. This first leg of the hike is on the western section of the Oak Creek Canyon Loop Trail which winds through a very nice oak grove. This is a handicapped accessable or “whole access” trail. Shortly after the handicapped accessable portion of the trail ends, a trail off to the left will loop back to our start point. 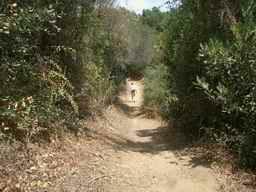 We’ll take that trail on our return trip, but for now, continue ahead and turn right onto Los Robles Trail. 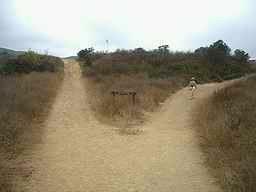 Soon, there is a split in the trail. 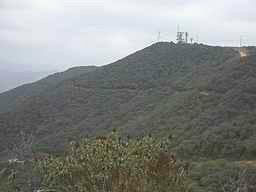 From here, Los Robles trail runs east (to Triunfo Park and beyond), and west (to Potrero Road, where it hooks up with trails in Rancho Sierra Vista/Satwiwa and Point Mugu State Park). 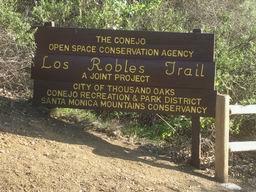 Follow the signs pointing to Los Robles Trail West. 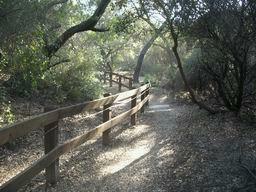 This multi-use trail (open to hikers, bicyclists and equestrians) is especially popular with hikers and bicyclists. 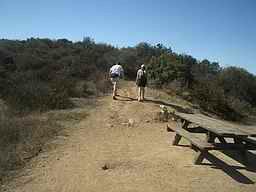 Trail users must be courteous and alert. A lot of the ascent is on this (approximately) mile-long set of switchbacks. The switchback trail makes it a comfortable climb. After gaining about 700 feet in altitude, the elevation will remain fairly constant for a while, giving you a chance to take in the scenery. If the climb didn’t take your breath away, the springtime wildflower display may. The views of the city below are stunning too. This is looking toward the north-east at Thousand Oaks. And this is Newbury Park to the north-west. The trail high on the hill across the ravine is Rosewood Trail (starting at Lynn Road). 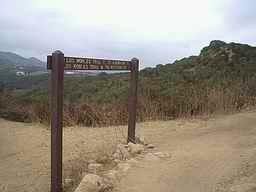 It is another popular a route to Angel Vista. 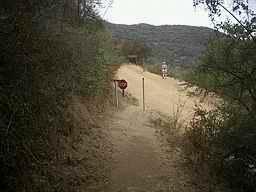 The private road seen below will cross Los Robles Trail not far ahead. 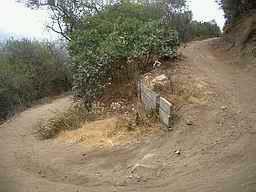 There is a short, steep downhill section of trail before the road crossing, then the final ascent to Angel Vista. 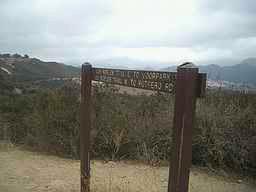 Near the top, at this three-way trail intersection, the sign points to Los Robles Trail east and Los Robles Trail west. Angel Vista is the nearby peak seen here in the upper-right. Take the connector trail to the right (not noted on the sign). 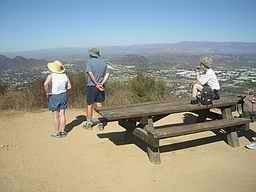 Angel Vista’s picnic table is a great place for a break, and to enjoy outstanding views of the Conejo Valley and surrounding area. 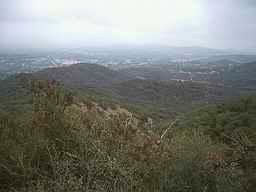 Just a short distance beyond the table, there is a slightly higher point with a 360 degree view of the entire area, including the Santa Monica Mountains, Hidden Valley, the Oxnard Plains, and (on a clear day) the ocean and Channel Islands. 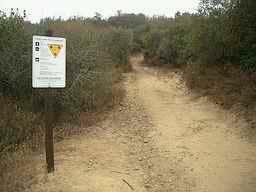 For the return trip, reverse direction and follow the signs pointing to Los Robles Trail east. 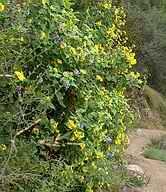 On the hill across the ravine (this time viewed from the Angel Vista side) is that pleasant horizontal section of Los Robles Trail with the great springtime wildflowers. 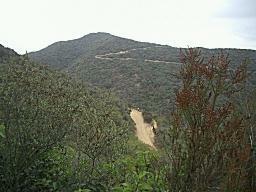 Starting back down the switchbacks, looking to the south-east across the open space, many of the trails in the Los Robles system are visible. For a little variation, the last leg of this hike is on the eastern portion of the Oak Creek Canyon Loop Trail. 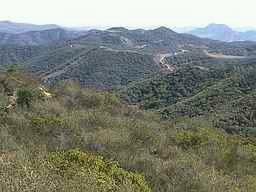 It has short up and down sections through the chaparral, and is very different from the western portion where we started. The trail ends at Greenmeadow Ave. To finish the hike, turn left and walk a short distance up the street to the parking area.